Here is the Latest 2018 L.K.Metro Go-Go Hopping Guide Map…This will help all newcomers when they come to Pattaya . Please – Copy and Paste and Print. Carry the Map with you to find your way around. A user on a popular Pattaya message board has updated his own map of Soi Lengkee. Kiss is now called Chaos however the signage outside has not been updated. They still have the old signs and kiss lips logo. 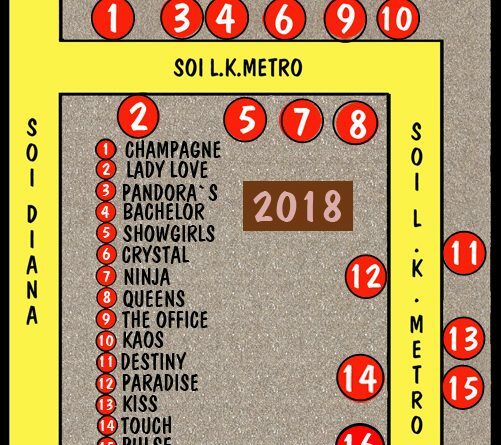 Our personal recommendations for LK Metro clubs are Queen, Champagne, Lady Love (bathtub included)… Champagne coyotes is a good place to pre-game for cheap drinks. Becuase there are so many bars in close proximity and a lack of crowds it is easy to go in, buy a cheap draft beer promotion and enjoy the show before moving on if you don’t find something that you like. Soi LK has increased in popularity as tourists become increasingly annoying on Walking Street, it makes getting around quite inconvenient and traffic is often backed up along beach road as many tour buses compete with other vehicles trying to deliver passengers to this tourist hotspot. Being strategically located in Soi Buakhow away from the central area of Walking Street and Beach Road gives an advantage to Soi LK, the bar area is an L shaped road closed to traffic and safe to walk around and sample the many bars. In addition, there are very few tourists. Even Soi 6 has occasionally been visited by tour groups behind a flag-waving tour group leader. However LK Metro has yet to attract this level of attention making it a popular spot for veterans and expats. There are several live music bars including the famous Boomerang which is well stocked with freelancers, if mostly on the older/more experienced side. Some will try to charge a bar fine but usually will just arrange to meet you around the corner. The Buakhow area around LK metro also has plenty of food and snack options catering for Western tastes such as kebab shops, fish and chips, pizza, burgers and the famous ladyboy spaghetti stall. There is even a 24 hour Subway restaurant and a McDonalds as well as independent foreign-owned bars and restaurants catering to punters late into the night. The infamous Kiss Food and Drink is a short walk down the soi to Second Road. Songtaews (Baht buses) run along Soi Buakhow itself giving access to both Pattaya Klang (Central) and Pattaya Tai (South Pattaya Road), and of course there are ample motorcycle taxis. There are also a number of ladyboy bars around but these are clearly identifiable and it is unlikely that you will be bothered, or walk in accidentally. In fact you may find yourself enjoying the beauty as there are some stunning kathoeys. Otherwise there are a few Thai traditional type beer bars to be found in the area if your budget does not stretch to expensive lady drinks and a 2000 baht barfine (unfortunately this is now common for the best girls in LK gogos, pricing has reached Walking street levels). If you havent visited the area before it is worth a try. ← Ago-go girls: dancers, showgirls, and models? ?